ECHOage Inc., its successors and assigns (collectively “ECHOage”) operate and make available the website echoage.com (the “Site”). In this policy ECHOage describes: (i) how ECHOage collects personal information via the Site; (ii) the types of personal information that ECHOage collects; (iii) how that personal information may be used; (iv) how that personal information will be safeguarded; and (v) when and to whom that personal information may be disclosed. ECHOage recognizes privacy and security as being concerns for most individuals accessing the Internet, including any individuals who become users of the Site. 2. the web site of the Information and Privacy Commissioner for the Province of Ontario located at www.ipc.on.ca. By complying with the laws of Canada for the protection of personal information, ECHOage is complying with a set of privacy laws that have been found adequate by the European Union. ECHOage also works to comply with the: (1) Children's Online Privacy Protection Act (“COPPA”) a U.S. law that governs the use and collection of information online from children under the age of 13. To learn more about COPPA, visit: http://www.ftc.gov/bcp/edu/pubs/consumer/tech/tec08.shtm for information from the U.S. Federal Trade Commission. 3. www.ftc.gov/bcp/edu/pubs/consumer/tech/tec08.shtm (published by the U.S. Federal Trade Commission). PLEASE NOTE: As a parent or guardian, you should also be careful about the information that you post about your child online (for example personal details and photographs) and to whom you email information about your child. Individuals who have access to this information (for example, the guests that you invite to an ECHOage Party) can take this information and forward it electronically. Read the Parent Page at the Site for further tips. Using the Site is not contingent on a child disclosing more information than is needed to participate. Registered User’s accounts are password-protected. If any unsolicited message claiming or appearing to come from ECHOage or the Site requests password information or userID information, do not respond to it and report it to ECHOage by forwarding a copy of it to [email protected] ECHOage will never ask for the password to a Registered User’s account in an unsolicited message. WHO IS A USER AND WHO IS A REGISTERED USER? A “User” is an individual who uses the Site (as a casual visitor, Registered User or otherwise). A “Registered User” is a User who has registered himself or herself with the Site or has been registered with the Site by a parent or guardian. 3. WHAT PERSONAL INFORMATION IS COLLECTED BY ECHOage AND FOR WHAT PURPOSES IS IT USED? • data relating to how individuals interact with the Site (for example, the amount of time spent on a certain page). • to tailor how an individual experiences the Site. PLEASE NOTE: ECHOage aggregates and depersonalizes this information. ECHOage uses the aggregated and depersonalised information to: (i) better understand how the Site is being used in order to improve upon the Site; (ii) encourage charities to participate in ECHOage’s donation program; and (iii) to report on the effectiveness of the Site to charities that participate in the donation program. PLEASE NOTE: ECHOage will not knowingly allow children under 13 years of age to become Registered Users of the Web Site without parental consent. Please note that when a credit card is being used to make a donation, ECHOage assumes that a parent or guardian is the one initiating the transaction. Accordingly, ECHOage can rely on the transaction to obtain verifiable parental consent. • screen name and password suggestions (which in the User’s discretion, may or may not include personal information). If a User indicates that he or she is under the age of 13, a notice of the User’s registration will be sent to his or her parent or guardian at the email address supplied, but the registration process will continue. In the notice, the parent or guardian will be provided with the right to terminate the registration through a simple link or by mail or fax. If a parent chooses to do so, ECHOage will take down any profile of a party by the User from the Site as well as any materials posted by the User and delete the registration information provided by the User from the production database used to operate the Site. The information described in this section 3.2 is used by ECHOage for: (i) administering and operating the Site (including the profiles portion of the Site); (ii) administering and operating the donation program; (iii) any purpose disclosed to the individual when the individual created his or her profile or updated it; (iv) sending email to relating to parties, donation confirmations, reminders, alerts, and updates about ECHOage, and, (v) other purposes reasonably ancillary to those purposes. When a Registered User choses to host a party, a base profile of the party is created by ECHOage. A base profile sets out the userID assigned by ECHOage to the Registered User hosting the party and placeholders for information and other materials relating to the party. Typically, a Registered User’s userID will be based on a name suggested by the Registered User. ECHOage collects any personal information that a Registered User may voluntarily include as part of the profile or the materials that the Registered User posts to the Site. The information described in this section 5.3 is used by ECHOage for: (i) administering and operating the Site, especially the profiles portion of the Site and the donation program; (ii) displaying the party profiles created by Registered Users; (iii) any purpose disclosed to the Registered User when the Registered User created the party profile or updated it; and (iv) other purposes reasonably ancillary to those purposes. • other personal information which a reasonable person would consider ancillary to the types of information set out. This information is used by ECHOage for the purpose of operating and administering the web-based activity (for example, hosting a party or responding to an invitation to a party, for other purposes reasonably ancillary to those purposes and for any other purpose disclosed at the time when the individual signed up to participate or at a subsequent log-in to the Site. PLEASE NOTE: ECHOage aggregates and depersonalizes this information. ECHOage uses the aggregated and depersonalised information to: (i) better understand how the Site is being used in order to improve upon the Site; (ii) encourage charities to participate in ECHOage’s donation program; and (iii) report on the effectiveness of the Site to those charities who participate in the donation program. When a gift is made through ECHOage’s donation program, ECHOage collects personal information necessary for: (i) payment processing; (ii) processing gifts (i.e. deducting a ECHOage’s processing fee, donating to the applicable charity in the name of the guest who gave the gift and providing the remainder to the host of the party); (iii) arranging for the charity to whom a donation has been made to provide a charitable receipt and possibly another acknowledgement of the donation; (iv) responding to any inquiries about gifts made from the giver or his or her parent or guardian; and (v) for any purpose that would be considered to be incidental to one of the other purposes set out in this list. The Site may include other requests for individuals to volunteer their personal information. For example, ECHOage may administer surveys through the Site. When ECHOage creates an opportunity for individuals to volunteer their information through the Site, ECHOage will disclose the purposes for which the personal information is being collected and seek consent to use the personal information collected for such purposes. As well, the Site provides individuals with several opportunities to “opt in” to receive additional information or announcements from ECHOage. If an individual opts to receive additional information or announcements from ECHOage, the personal information that he or she provides to ECHOage may be used to: (i) provide the additional information and announcements; and (ii) tailor the types of information and announcements provided by ECHOage to the individual. Additionally, an individual who has previously opted to receive additional information and announcements may subsequently “opt out” by following the directions for doing so on the Site. A parent or guardian of a Registered User under 13 years of age may review any information their children have contributed to the Site, request that ECHOage delete all or part of that information, and refuse to allow ECHOage to collect further information from their children by contacting ECHOage by email at info @echoage.com. Parents and guardians should include their child's userID and their own email address (the one used when registering the child) in any such email inquiry or request. ECHOage may ask additional questions or take other steps to verify the identity of a parent/guardian before responding to any such request. COPPA provides parents and guardians of children under the age of 13 with certain rights in relation to their children’s online activities. For example, parents/guardians can consent to collection and use of their child's personally identifiable information in relation to a web-based activity without consenting to the disclosure of information to third parties other than as would be reasonably contemplated given the nature of the web-based activity. ECHOage recognizes the importance of giving parents/guardians these types of tools, and ECHOage does so. 5. CAN THIRD PARTIES COLLECT INFORMATION VIA THE SITE? When a User accesses the Site, ECHOage’s server may attach a small text file to the individual’s hard drive – a cookie. The cookie is used to identify the User whenever he or she returns to the Site. The information contained in the cookie is also used to tailor how the individual experiences the Site. Please note, by changing the settings of their web browsers, Users can prevent cookies from being set or delete them, but this may prevent them from participating in certain activities available via the Site. • encourage charities to participate in ECHOage’s donation program and report on the effectiveness of the Site to the charities. 7. WITH WHOM DOES ECHOage SHARE MY PERSONAL INFORMATION? ECHOage may share personal information which it has collected in relation to the Site with its directors, officers and employees who need to use that information in connection with one or more of the purposes for which that personal information was collected. From time to time, ECHOage may engage service providers to provide certain limited services such as hosting the Site or processing financial transactions. ECHOage will only provide those service providers with the personal information they need to deliver the service for which they were retained. ECHOage will also require those service providers, through contractual means, to safeguard such information, maintain its confidentiality and not to use that information for any purpose other than providing the services for which they were retained. Please note that such services providers may not be located in Canada. ECHOage may access and/or disclose any personal information which it has collected in relation to the Site if required or permitted to do so by law (for example, in order to comply with a legal requirement including but not limited to one imposed by a warrant, subpoena, court order or like instrument served on ECHOage or in urgent circumstances to protect the life, health or security of any person). Please be aware that ECHOage may disclose your personal information to its successor or any assignee of its assets relating to the Site. Before disclosing personal information relating to an individual to a third party other than as set out in this policy, ECHOage will obtain the affected individual’s consent to the disclosure. 8. WHAT ABOUT INFORMATION SECURITY? ECHOage uses physical, organizational and technological safeguards to protect personal information in its possession. For example, ECHOage uses encryption to safeguard certain types of personal information such as passwords when they are being transmitted over the Internet. However, please note that no data transmission over the Internet can be guaranteed to be completely secure. Consequently, ECHOage expressly disclaims all representations, warranties and conditions (whether express or implied) that any information transmitted to or by ECHOage over the Internet will be completely secure. 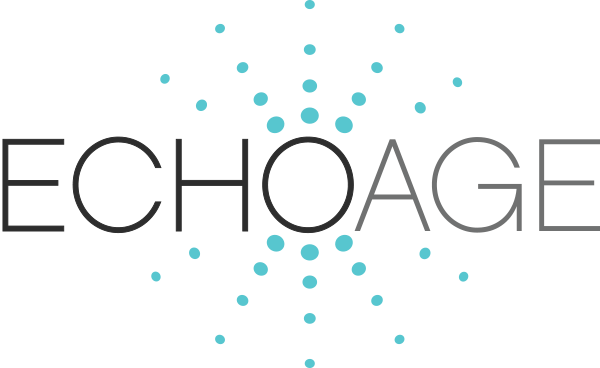 Please note that privacy controls are made available by ECHOage to its Registered Users, and although ECHOage has used reasonable efforts to test the effectiveness of its privacy controls, ECHOage does not guarantee that such controls will operate without defect or interruption or that they will never be compromised. Consequently, ECHOage expressly disclaims all representations, warranties and conditions (whether express or implied) relating to the controls. Registered Users have the ability to edit the profiles of the parties that they host (including but not limited to removing information that they previously posted to the profile). Log-in to the Site and use the tools provided to do so. Please note that back-ups of the Site created prior to the edits and retained by ECHOage will not be affected by any such edits. ECHOage has set retention schedules for any back-up of the Site that it may create as part of the routine operation and administration of the Site. With respect to any personal information supplied to ECHOage, ECHOage keeps personal information only for as long as the personal information is required for the purposes for which it was collected and compliance with laws and regulations. Consequently, there is no single retention period applicable to all instances of personal information collected by ECHOage. When any personal information is no longer required by ECHOage for the purposes for which it was collected, ECHOage destroys the personal information in a manner which takes into account the sensitivity of that information. ECHOage will occasionally update or change this policy. When ECHOage makes any change to this policy, an updated copy will be posted to the Site and the word "updated" will appear with the date of the change. PLEASE NOTE: By using echoage.com or consenting to a child’s use of echoage.com, one is consenting to ECHOage’s collection, use and disclosure of the User’s personally identifiable information in accordance with this policy. If a User no longer wishes to receive newsletters and promotional communications from ECHOage, the User may opt-out of receiving them by following the instructions included in each newsletter or the User may communicate its wish by emailing ECHOage at [email protected] Please type “UNSUBSCRIBE” in the subject line and set out the affected email address. If any User or the parent or guardian of any User under the age of 13 wishes to withdraw any consent (other than one related to newsletters and promotional communications from ECHOage), he or she may do so by emailing ECHOage at [email protected] Please type “WITHDRAWAL OF CONSENT” in the subject line, and clearly describe the consent being revoked. Please note that by refusing to provide certain types of personal information or by denying or withdrawing consent to use or disclose personally identifiable information for purposes identified in this policy, a User may be unable to participate in certain programs or activities sponsored by ECHOage.